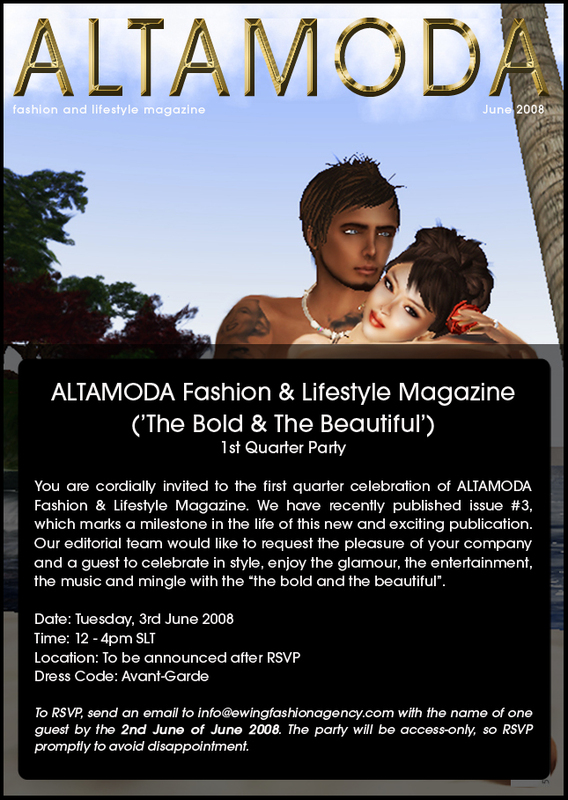 ALTAMODA Magazine (‘The Bold & The Beautiful’) 1st Quarter Party! Summer is a popular time for parties and that’s no exception here at EFA. Tuesday, June 3rd we will be hosting the AltaModa 1st Quarter Party. Entertainment will include a fashion show featuring the designs of Leezu Baxter and a classical piano peformance by Enniv Zarf. Please join us for this fun filled event. It’s that time of the month again. The Ewing Fashion Agency is once again taking requests for interviews to enter the Elite Model Training Program. This past May, we successfully offered simultaneous training programs for the three major time zones – EMEA (Europe, Middle East and Asia, The US and APAC (Asia Pacific). We are pleased to continue this month with classes being offered at 4am, 11am and 5pm SLT running from June 9th to 20th. Any model, man or woman, that has the drive and dedication to be the best is encouraged to inquire. EFA’s Top models Tempest Hennesy and Rena Mascot and titled model, Aleida Rhode, will once again be heading these sessions prepared to continue last months success. For further information and to stay updated on possible changes, visit the EFA Fashion News Blog regularly and join the ~* EWING TRAINING WAITING LIST *~ group. Interviews will be conducted June 4th and 5th at 12pm SLT. If invited to interview, remember to dress professionally and comport yourself appropriately for the industry. You only get one chance to make a first impression. After all interviews are finished successful applicants will be notified and invited to register for classes at a time slot convenient for them. More information on the training course can be found at the EFA website. We look forward to seeing you at the interview and wish you the best in realising your runway potential. Thank you, Levi Strauss, for your contribution to the fashion world. Little did you know how your vision would storm the world. We all have our favourite pair of jeans that we NEVER throw away and when they become threadbare, voilà – we have another fashion style. Jeans are the staple of everyone’s wardrobe and that is no exception in Second Life. We are blessed with many designers giving us all manner of expressions. Today, I am going for the simplicity look. Out of my vast closet of jeans I picked out my favourite from Pixel Dolls. I have worn them so often they are now as soft as flannel. I love the faded blue colour and the stitch work on the back of the hip pocket. They come with prim leg bottoms. My absolute most favourite look is pairing the jeans with a plain white tank top. This perfect tank top comes from Muism. The tank comes in various layers and you can wear it tucked in or out. The shading gives it just the right amount of folds. You get two tanks when you buy this top, one in black and the other in white. The pièce de résistance is this light blue denim jeans jacket, also from Muism. It comes in 3 looks: a plain vest, a jacket without sleeves, and a jacket with a stand-up collar and rolled up sleeves. Your other colour choices are black, original blue, dark blue, and grey. Now, while I would normally put on a pair of sneakers I could not resist the adorable blue striped mules from Shiny Things. They are a perfect match to the jacket. Because I always feel naked without any jewelry, I toss on a choker and a leather cuff… and I am ready, Mr. Laurent, for my expression of simplicity! Art and fashion often evolve to display a commonality of attitude of a culture, place or era. I think this was certainly true of 1950’s America, which gave rise to rock-n-roll. Much of the music of this time had a fun and carefree air, as exampled by Bobby Darin’s “Splish Splash” or Bill Haley’s “Rock Around the Clock.” Fashion styles also evolved to incorporate these themes. Today, I would like to show you two outfits that represent the fun, feminine fashion that was popular at the time. The poodle skirt, often being used for dancing or just hanging out at the local diner, and a flouncy knee length dress, perfect for a movie date at the theater or drive-in. Both are from Ivalde, a wonderful store for vintage shoppers. Neferia Abel has selections from the Baroque era to current day styles, much of it sorted into decades for easy shopping. The pink poodle skirt ensemble, pictured left, comes with two skirt and two blouse options, each with or without the poodle, and a prim scarf. The belt is on the jacket layer so it’s optional or can be replaced by another of your choosing. This outfit is also available with a red, black or yellow skirt. Added to the pictured ensemble are saddle shoes from The 50’s Store and Haalsa Hallard lace frill socks with pink ribbon. The jewelry is pink lulu4 bangle bracelets from Artilleri and Kraftika earrings no. 106 also in pink. ALTAMODA Issue #3 is now out! We are pleased and very excited to announce the publication of issue #3 of ALTAMODA Fashion & Lifestyle Magazine. This issue is a huge bumper version to date, packed with amazing interviews, amazing people – including the guys behind KMadd Enterprise (Kirk Claymore and Maddox Dupont), Phaylen Fairchild from DIVAS, Simone Stern answering our readers’ letters, Sofia Gray, Iustinian Tomsen and so on. The list is long! We also feature great style advice, reviews and the Summer of ’08 Beach Wear Guide. There is so much more to discover in this month’s AMM. We are sure you will enjoy it and it is one good-looking issue! We would also like to announce that the winner of the ALTAMODA Magazine distributor free ad giveaway is vendor number 72, which belongs to Leezu Baxter and is situated on the To The Nines Sim. Leezu, congratulations! To claim your free prize, worth L$ 10,000, simply send us a full page advert (w: 636 x h: 900 pixels) and you will be featured next month. To get a chance to win free advertising in ALTAMODA, SL’s premiere fashion and lifestyle magazine, simply visit SLExchange or Onrez, search ALTAMODA and buy a complimentary set of vendors for placement at your locations. The prize draw occurs every month. Next month could be yours! Ewing Fashion Agency is proud to announce the graduation of Ella Quinsette, Lacey Bade, Maedin Tureaud, Sofie Knoller, Lauren Mureaux and ZoeAnastasia Aeon, which was held on May 25th, into the world of modelling. All of the graduates have great potential and worked really hard to complete the 10 day course. We would like to wish them every success in their future. The glamorous graduation ceremony in the Ischia district started at 1 PM SLT, with the new models making an appearance on the runway while an audience of of family and fashion industry representatives watched, applauding loudly. A special thank you to the people that were present for making this a memorable night for everyone! Thinking of becoming a model or want to brush up on your skills? See the model training course page here for more information and prices.